As you're no doubt aware by now, the rankings released at the end of Roland Garros will not just mark the success or failure of touring pros over the last 52 weeks, but also the culmination of a four year race to represent one's country at the Olympics. The June 11th ATP and WTA rankings will be used as the official ITF cutoff for Olympic eligibility. Over the course of the tournament, one narrative (at least for American watchers) has been around the question of which women will make the US Olympic team. We wanted to help clear the air a little. Ultimately, well...we don't quite know yet, but we're close. Read on to see how things are playing out. Serena Williams: Ranked fifth in the world, and having flown to the Ukraine to ensure she met the Fed Cup eligibility requirement, Serena Williams seems a lock for Team USA. While her uncharacteristic 0-for-2 visit to Roland Garros may leave some with questions, it left us with only one...is Serena already practicing for her two runs on the All England Club grass. Christina McHale: The 20 year old Jersey girl, Christina McHale, came into Roland Garros safe as well, as the second ranked American. Entering Roland Garros ranked 36th in the world, she only had with only first round points to defend. McHale reached the third round, losing earlier today to the 7th seeded defending champion Na Li 3-6, 6-2, 6-1. Venus Williams: The three-time Olympic gold medalist fell off the radar when Sjogren's Syndrome forced her off the court at the 2011 US Open and put her career in doubt. Ranked 134th in the world just three months ago, Venus has embarked on a concerted mission to make the Olympics field. Reaching the quarterfinals of Rome, Charleston and Miami make her likely to finish among the top four Americans despite her early exit in Paris. She's currently the No. 3 ranked American. Varvara Lepchenko: Lepchenko followed her upset of Francesca Schiavone in Madrid with a repeat performance on the red clay of Roland Garros today, winning 3-6, 6-3, 8-6. The win over the 2010 Roland Garros champion put Lepchenko in the fourth round of a major for the first time in her career. More importantly, it boosted the Pennsylvania based lefty into the No. 4 slot among US women. Vania King: King entered Roland Garros ranked 57th in the world and as the No. 4 American she also came in with the most points to defend having made the third round a year ago. This year, she fell unceremoniously in Round 2, defeated by 15th seed Dominika Cibulkova 6-0, 6-2. The loss itself would have likely pushed King out of the top 56 and reliant on the hope of an ITF wild card to make the team. 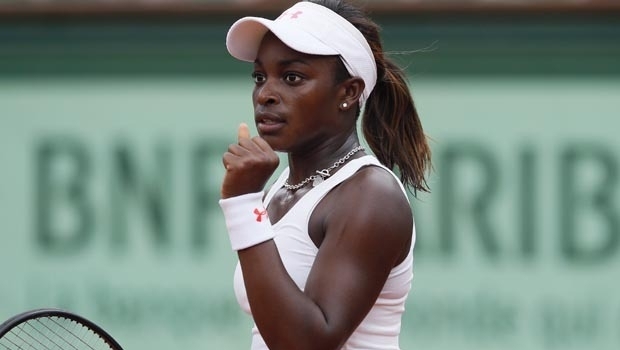 Sloane Stephens: 70th in the world and with two women ranked ahead of her on the US team, the 19 year old needed to make up a fair bit of ground to make the US team, but she's still in the race. Her run to the Sweet 16 of Roland Garros has helped her largely do that. The No. 56 player in the world last week, Silvia Soler-Espinosa had 1157 points last week. Based on making the Round of 16 at Roland Garros, Stephens is projected to have 1148. For Stephens to make the US Olympic squad, she will have to beat Samantha Stosur, and progress further in the tournament than Lepchenko, the current US No. 4. But that would be waaaay too straightforward. Who plays on the team, among the WTA Top 56 is ultimately the USTA's decision. If Stephens makes the Top 56, the US Would have the opportunity to select four of the five. While the ITF states that the national federations should select their top four players in the professional rankings, it's not a mandate. One possibility, Venus Williams may forgo singles if she gets a wildcard into doubles with sister Serena. Venus has been targeting the London 2012 since her return from Sjogren's Syndrome. That said, great champion though she is, this Venus, the 2012 edition, is largely considered a singles contender because her game seems tailor made for the lawns of Wimbledon where she's won an almost Federer-ian five titles. There is also lingering speculation that Venus may not have fulfilled her Fed Cup duty by making herself available twice between 2009-2012. That could open up a spot for the No. 5 American. Either way, as much talk as there is around the rankings cutoff, it looks as if the end of Roland Garros won't tell us the entire story around the women the US sends to the Olympics. Fun to speculate though, no? Or simply found your rolex replica watches. It's just a multi-purpose adornment which is used in always keeping either special plus typical reports. Together, it might be your design solution identical beautifully together with the outfits. Your criminal encounters a superb pet inside of a travelling bag including a performing fake rolex normally requires the girl's travelling bag for a efficient tool. Now chanel replica wholesalers have got to continue to keep 100 % collection of carrier's networks so that you can woo prospective buyers. Any women in spite of the girl's time plus deliver the results demands travelling bag. By way of example go on a housewife this rarely use goes out owing to the girl's fast paced agenda around dealing with your family house work. You will express this the woman won't here is a travelling bag employing certainty the woman requires a fantastic tote. This lady has loads of reports to place. The woman stays in sector to create domestic prada replica sale and even this lady has to take care of small children and various close family. It is really unusual to check out this housewives apply its baggage regardless of whether they can be at your house. Tennis is a popular game and widely popular among people around the world. After any big tennis tournament, we have found some minor changes in the world tennis ranking. Especially in the women category Williams sisters are in the top of the ranking list, but still, others are also able to manage their position the ranking table.